In spite of the bloody events in Libya, the Western world still seems to be euphoric about the revolutions in North Africa. This is no great surprise, since Europeans have never before seen young people in cities there coming out in support of Western values, free speech, free and fair elections and freedom of assembly. The television images have brought back fond memories of 20 years ago, when the peoples of Eastern Europe overthrew their Communist regimes, touting the same democratic slogans that we are hearing from the youth in North Africa today. In the European Union, people have suddenly stopped fearing that pro-Western Arab leaders might be succeeded by Islamic fundamentalists. They have come to see the bogey of radical Islam played up by political scientists as little more than a myth. The consequences of this radical turnaround of consciousness are both positive and highly negative. Lack of fear is blunting the sense of self-preservation that has traditionally informed the attitude of Europeans to their North African neighbours. Yet it must be remembered that the revolutions that have gone off so smoothly in Tunisia and Egypt are a far cry from what is currently happening in Libya. Just a couple of weeks ago, it seemed that democracy would triumph there and Gaddafi would escape to a Latin American country. But events there have since gone terribly awry, and what started as a popular uprising has now mushroomed into a civil war. 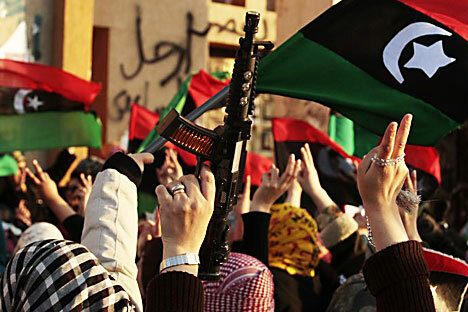 It is doubtful that Europe expected such a bloody regime change in Libya. This distinctly non-textbook scenario of transfer of power will probably cool many hotheads in other countries dreaming of change. Presidents in Central Asian countries have been in power for several successive terms, yet European public opinion is gravely mistaken if, having come to believe in the possible Europeanisation of Tunisia, Egypt and perhaps Bahrain, it anticipates that a similar scenario will play out in the Central Asian states recently created in the outposts of the former Soviet Union. Their leaders, who may rightly be called the founding fathers of their nations, will not be forced to relinquish power without a bloodbath. The revolutionary sentiments of the Arab world may, indeed, reach Central Asia, Russia’s “soft underbelly”. A number of political analysts consulted by this author admit such a possibility. Yet the scale of future protests would depend on the early results of the continuing spate of revolutions. If they lead to chaos and protracted civil wars in Egypt and Tunisia, along the lines of Libya, and if formerly stable North African countries become Somalia-like quasi-states, Europe will hardly wish for a repeat of such a scenario in Central Asia. As one Soviet-era song puts it: “Revolution has a beginning but it does not have an end.” Europeans should bear this in mind if they do not want to sit atop a powder keg for many years to come. If the world community fails to avert chaos in key North African and Middle Eastern countries, various pro-Islamic terrorist groups, riding the crest of popular uprisings, will gain access to huge resources and will penetrate vast territories. Then these forces will come to Central Asia, which they perceive as another bridgehead in the attack on Europe, not in sorties, but in a massive, armed onslaught. Is that the kind of bearded Taliban-style revolution that people in the Old World want to see? According to the Collective Security Treaty Organisation, which includes Russia, Kyrgyzstan, Kazakhstan, Tajikistan and Uzbekistan, several years ago the Taliban in Afghanistan were discussing ways to destabilise the situation, first in Central Asia and then in the Caucasus. If these plans materialise, Nato troops in Afghanistan will have to open up what would amount to a “second front” against the enemy. So far, Islamic radicals are concentrating their resources mostly in Afghanistan and Iraq. But the extremists’ potential will grow dramatically if radical Islam succeeds in unleashing chaos in the vast expanse from Morocco to Saudi Arabia. The only revolution that could possibly happen in Central Asia is an Islamic one. The secular democratic opposition in the region is too weak to hold the reins of power. Some cities might, of course, see outbreaks of unrest inspired by the events in Egypt and Tunisia, but local authorities are prepared to quash any such protests. The key causes of the recent revolutions have been the absence of any so-called social lifts, which are capable of dampening popular discontent and mitigating economic problems. With the possible exception of Kyrgyzstan and Tajikistan, however, the situation in the Central Asian countries is fundamentally different. They are experiencing an economic boom driven by growing energy prices, enabling the old Soviet-era elite to skilfully contain broad protest sentiments. These former “apparatchiks”, who went through fire and brimstone under Socialism, know exactly how to nip popular unrest in the bud. The North African revolutions might, indeed, prompt even the more autocratic Central Asian regimes to think about putting a series of cosmetic reforms in place. These reforms will create a semblance of change without posing a serious threat to the rulers. And they may just prevent a classic revolutionary situation, when those at the bottom do not want to live as they did in the past, while those at the top cannot rule in any but the old way.